4 (36, 38, 40, 42, 44, 48, 52)"
Chic Knits Tauriel is a modern cardigan with lovely chain-cable detailing, knit in progressive sections, featuring no seaming. The upper section is constructed from side-to-side then the lower body is picked up from the upper sections and worked to the hem. Sleeves are worked in-the-round after body section is complete. 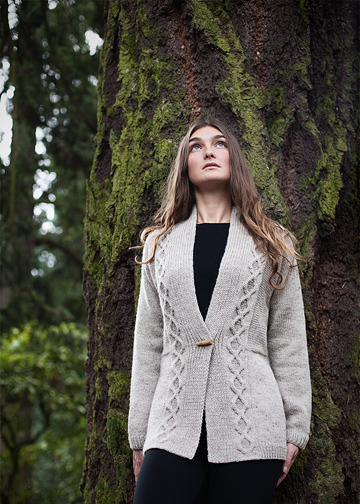 Tauriel uses Aran Weight yarn in a quick-to-knit gauge of 4.5 sts per inch.